After reading an article in one of the airgun magazines I booked a week in June for me and my nephew. In summary, it was brilliant and I'd reccomend it to anyone interested in shooting, especially if they don't have land already to shoot on. 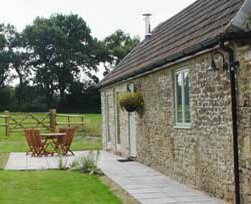 Park Farm Cottage is on the Somerset / Wiltshire border and is still an active farm, run by Ro Norman, with his wife and 2 kids. 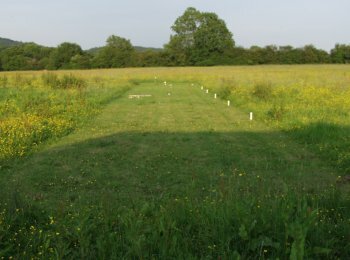 It covers several acres of mainly quality hay meadow with no animals apart fro ma few chickens, ducks and two friendly dogs. We arrived just after lunch on the Saturday that England began their World Cup bid. The place is easy to find, and as we drove along the long drive to the farm we were already excited about the week to come. Ro met us as we pulled up, and the dog sniffed us both. Ro showed us round and I was impressed immediately with the cottage, it was very clean, large and well kitted out. He had two maps of the area showing the large amount of land we had to play on and where not to venture. We unpacked and watched a bit of the England match on the TV (there is also a video and DVD player). We hadn't brought anything for lunch so headed off to the pub to find it closed at 2pm! So we headed to the nearest village to find the pubs shut and the cafe closed! So we headed to Frome - and found the cafe wasn't serving food! As it was now 4pm and we were very hungry we gave in and had a McDonalds!! A visit to the local supermarket followed to stock up. The field closest to the cottage has been cut short and a range set up with distances from the fence - or inside the cottage if it's raining! There were a couple of spinners (we added our own) plus a dangling washer and golf ball that made a great noise each time you hit it. That evening we left our rifles in the cottage and headed to walk round the various fields. There are several separate fields with either hedges or small woods with streams running through them acting as boundaries. Whilst in one wood I could see the grass moving in the field so we stopped walking and kept quiet. The movement continued and then a small plop from the stream was followed by a badger emerging about five metres from us. He stopped and had a good sniff for a minute of so before continuing his journey. The evidence of badgers was all over the fields as they dug for worms and pig nuts. We saw them most evenings we were there. That evening was the first of many barbeques. 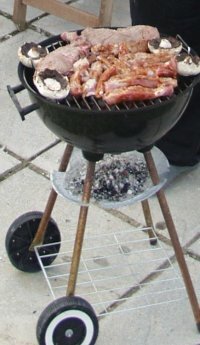 Ro provided the barbeque, we brought our own charcoal and steak. One of farm cats visited that night (the dogs always seemed to be there and one of the chickens wanders around), but Ro warned us to keep it out the cottage as it had fleas!! I had one of the single beds and James slept on the sofa bed in the living room. You could easily bring her indoors and a couple of kids. The first morning I found the hot water wasn't working so I went to see Ro and spotted a deer along the farm track. She had two fawns, but we didn't spot them until later in the week. Ro reset the hot water and it continued to work fine the rest of the week. On Sunday afternoon we used the range for a bit of plinking before venturing out to explore the land across the other side of the road to the cottage. There are several fields this side, together with a pond, where we saw signs of deer. We also saw rabbit droppings but the grass was so long we had no chance of actually seeing the rabbits! We spoke to Ro and he told us there weren't many rabbits on the land due to mixy, but he had been long netting on a neighbour's farm.. We asked if he was going again and told him we'd like to come along as neither of us had been long netting before. Having spoken to him after our trip he told us he is now offering "extras" such as lamping and foxing, so ask him if you want to try something you've not done before. I happened to show Ro my rangefinder and he said one of his neighbours had shot a fox across the valley from him and was keen to find out the range. If we took it with us to his farm he'd probably agree to let us have a go at the rooks on his land. The dairy farm was just down the road and the famer, Rob, had been warned we'd be popping by. He showed us were he'd shot the fox and we calculated it to be about 390 yards! 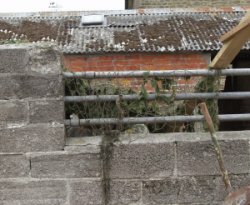 Rob showed us where the rooks were feeding on a maize clamp and said we were welcome to have a go. He suggested setting up a hide using some of the plastic sheets. We moved a large bale over and placed the sheeting over this. We managed to get a few rooks (I didn't realise how big they were) plus a couple of wood pigeons, which we took back for the barbie. We visited a couple of times and also built another hide by moving some tyres around and using another piece of plastic. Rob was a great help in offering advice about rook behaviour and the best way to hide both us and the gun. Sadly the day I took my camera to photograph the hides the battery was flat! We also got to shoot on another farm not far away in Wincanton. 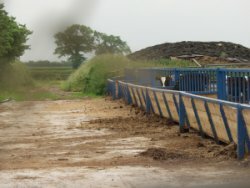 This is a dairy farm with lots of rooks and doves eating the cow feed. Again the farmer, Frank, was very welcoming and one of the farm workers showed us the best places to set up. He even had some camo net to help with a hide. Within minutes we had our first dove (for another barbie of course). I set up the hide for the rooks and James stalked round for the doves. The pictures above shows the rear of the feeders (the smudge on one is the camo net) and to the left a view of the hide. You can see my arms (but not face, as I also had a veil on) as I'm leaning forward. The rooks had no idea I was there and happily landed on the feeders. My problem was the cows behind meant I had limited places where I could shoot knowing it was clear behind if I missed. I retrieved the ones I shot from the feeders as I noticed the rooks went ballistic when they returned and saw their dead mate! Some fell into the cow pen and couldn't be retrieved, but as they disappeared into the cow pats I think they were quickly covered up. My nephew spent a couple of evenings in Ro's barn after the rats. He used my BSA Ultra and lamp with a red filter. The first night he got a couple of the buggers, but the second night they didn't play ball and stand still long enough. Ro had cut the hay in one of the fields and there were several birds feeding. I set up a hide on the edge of the field in the woods but found the curve of the field meant I couldn't get a shot when they were on the ground. You'd really need a shotgun and get them as they came into land. On the last night Ro took us to a neighbour's farm long netting. Ro set up about 100 metres of homemade net and then I drove into the field in the Land Rover whilst James went on foot to herd the rabbits towards the net. We only got one, Ro said that they'd tried it previously and got loads. After we wound up the net and drove further into the field, we later saw several rabbits that had mixy, so it appears numbers had been reduced here too. Ro had brought his .223 with him and proceeded to squeak and use an electronic squeaker to try to call in a fox. Within about five minutes one came out behind only about 30 metres away and quickly ran off. We went to see if it was in the next field, but couldn't see it. A few minutes later we could see it with the lamp about 100 metres away and Ro let James take the shot (I was being the good uncle as he'd never fired a centrefire before). We guessed he'd missed as we couldn't find the body and Ro went back the next day and couldn't find it in the daylight either. In summary, it's a great place to spend a holiday even if you aren't shooting. You could easily bring the family and either go with them on days out or send them on their way whilst you do the business. If you come solely to shoot, then at certain times of the year (like when the grass is long) there might be limited "targets" on the farm. Ro did say there were squirrels in one of the woods, but we were too busy to seek them out! Ro can hopefully also introduce you to another farmer who does have something to hunt. Talk to Ro when you arrive and discuss what you have and haven't done - and what you'd like to try. He is a great chap, very friendly and is keen to help you get the most out of your trip.